Easy Arlettes | I Wanna Bake! For those following along at home, arlettes were the technical challenge for episode 2 (biscuits). The challenge involved making puff pastry from scratch in 2½ hours, which is no simple feat. I decided to make it a bit easier on myself this time around and use store-bought puff pastry, which admittedly takes away most of the challenge (but still makes some delicious cookies). I do still intend to try the full recipe, but sometimes you just want a shortcut. 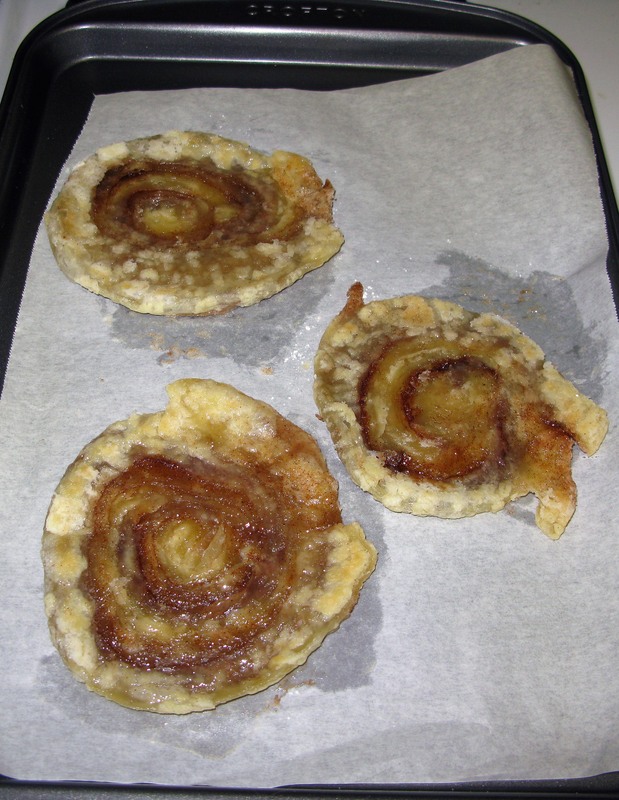 I followed the procedure from Paul Hollywood’s recipe for arlettes for the most part, but made a few changes. First and foremost, I used the aforementioned pre-made puff pastry (Mary Berry would have a disapproving stare for that). I also chose to fold the dough in thirds instead of using the prescribed book fold, mostly because my puff pastry was already creased, and that just made the whole process easier. 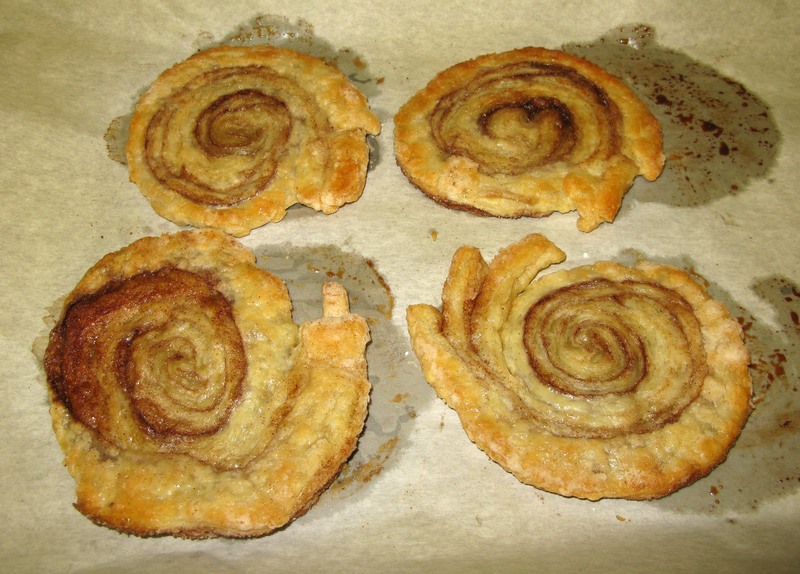 Finally, I found the arlettes needed to bake for a bit longer after they were flipped than the recipe stated. After the final 4 minutes, the dough was still a bit raw, so I left them to bake a bit longer. You really have to be careful with the final baking time, because puff pastry can turn from raw to done to burnt in the matter of a minute. I highly suggest watching them bake almost the whole time so that you can pull them out immediately when they look done. I found that the arlettes were easier to roll out if you first flattened the slices with your hand. 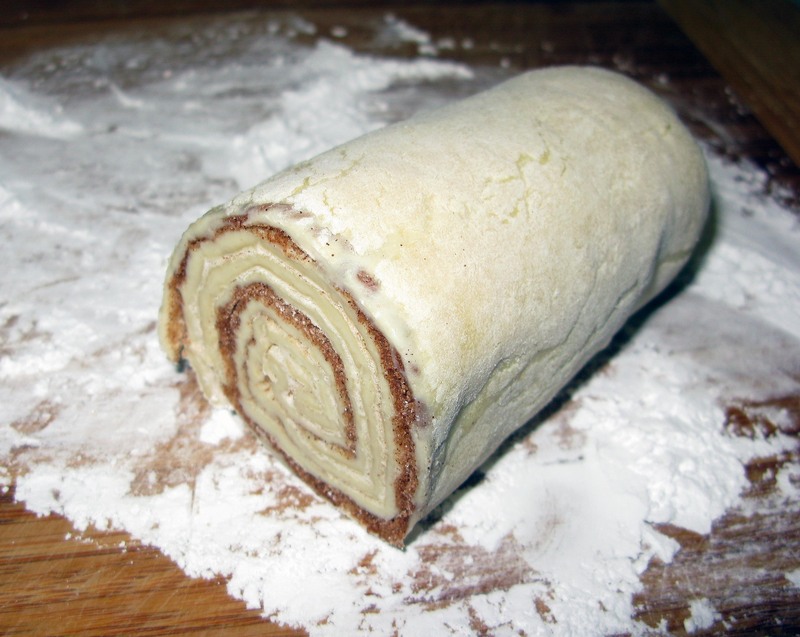 If you try to roll them with a rolling pin from their full thickness, the layers get distorted and the ends unroll. Pressing them directly downward helps to preserve the all-important layering, and also makes it easier to control what the ends are doing. 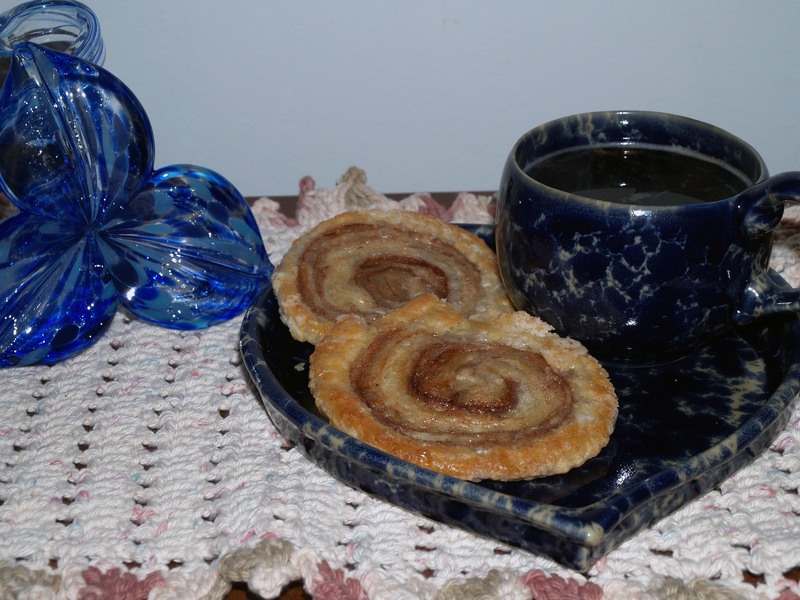 When baked properly, these cookies are flaky and slightly glazed from the melted cinnamon sugar. It is essential to roll them out as thin as possible, because if they are too thick, the edges can burn while the centers are still under-baked. They are best served fresh, but I was surprised to find out that they reheat pretty well in the oven (about 5 minutes at 350°F does the trick). You could also try putting them on top of a hot mug of coffee or tea like a stroopwafel if you don’t feel like firing up the oven. I’m back to Smash Mouth this week. It’s fun, nostalgic (for me, at least), and easy to pause when you leave the kitchen. Stir together the granulated sugar and cinnamon in a small bowl and thaw the first sheet of puff pastry according to the package directions. It should be just supple enough to unfold without cracking, but still cold. 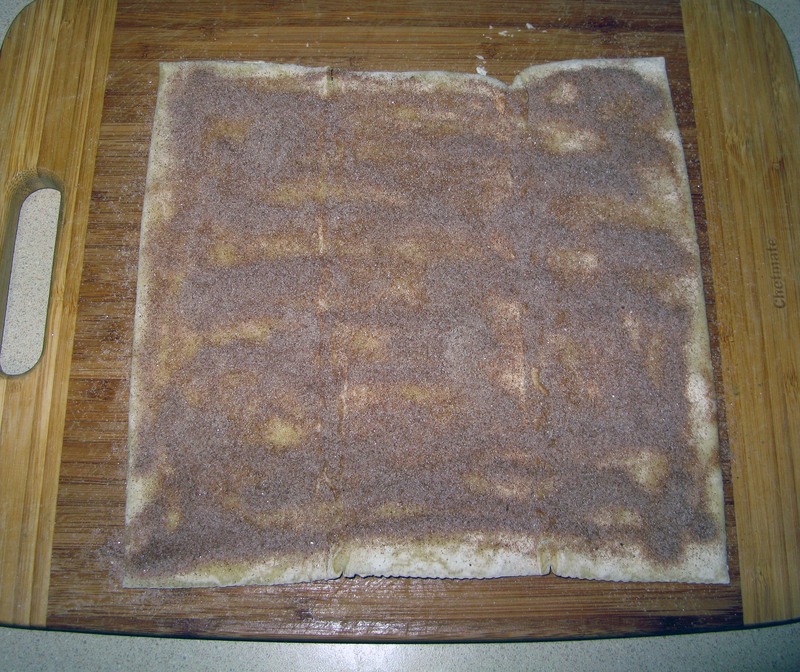 Sprinkle half of the cinnamon sugar mixture evenly across the top of the pastry sheet. Carefully re-fold the pastry sheet along the existing creases. 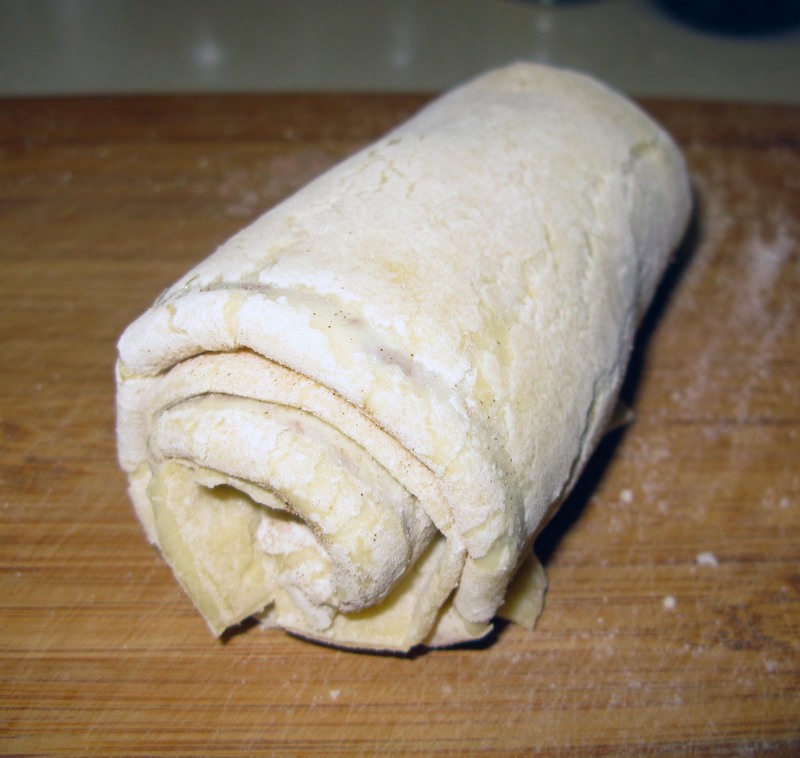 Using a rolling pin, gently roll out the folded puff pastry until it is about half an inch wider and slightly thinner. 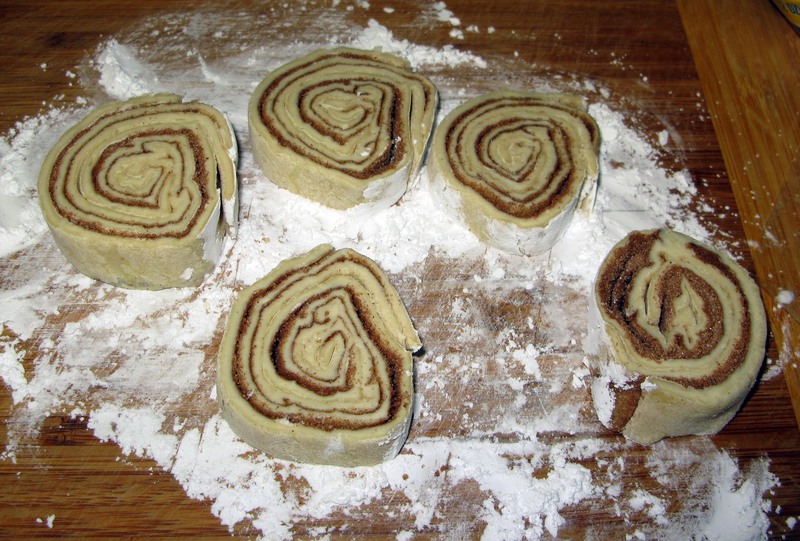 Starting from the short end, roll the folded pastry sheet into a log (like cinnamon rolls). 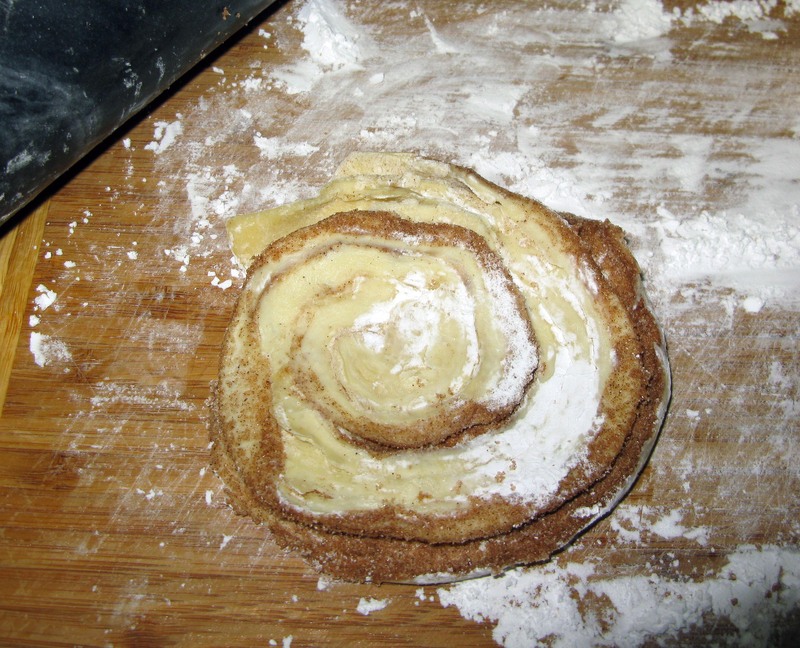 Repeat the process with the second sheet of puff pastry and the remaining cinnamon sugar. Wrap the logs in plastic wrap and refrigerate them for at least 25 minutes. When your pastry logs are chilled, preheat your oven to 400°F and line some cookie sheets with parchment paper. 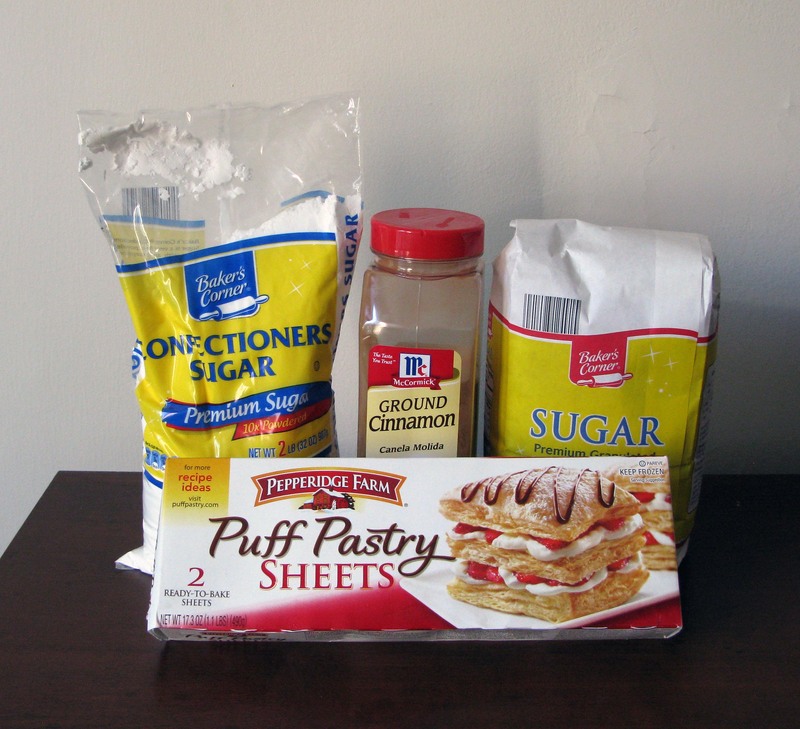 Dust your work surface well with powdered sugar and unwrap one pastry log. Trim and discard the ends. Slice the log into ½” slices (I got 5 out of each roll, but probably could have gotten 6 if I had been a little more conscientious). Sprinkle the tops of the discs with additional powdered sugar. One at a time, press them flat with the palm of your hand (this helps to maintain the shape) until they are about ¼” thick. 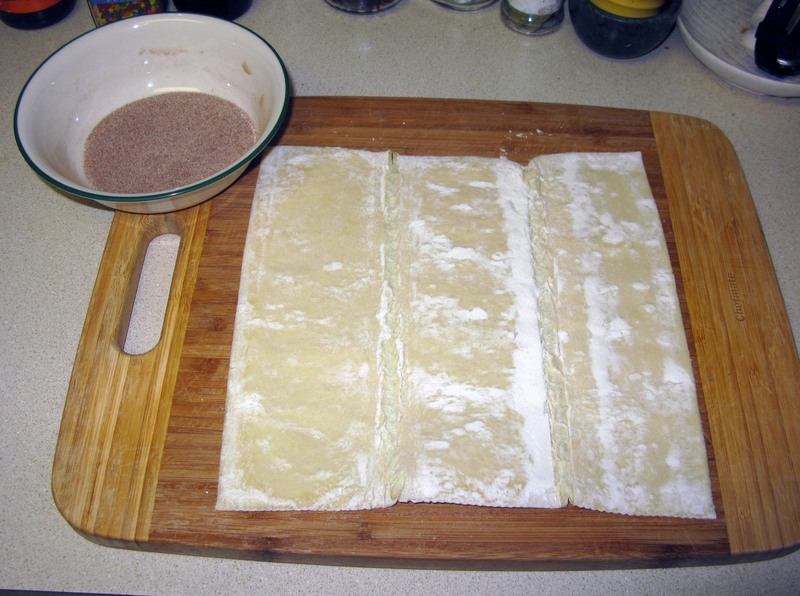 Using a rolling pin, carefully roll the slices until they are paper-thin circles. Transfer the circles to the cookie sheets and keep them refrigerated until your oven is ready. When it is, bake the cookies for 5 minutes, then remove them from the oven. VERY CAREFULLY, flip each cookie over. Put them back in the oven and bake for another 3-5 minutes, or until the tops are an evenly-baked golden brown. You will need to watch them carefully in the last 2 minutes so that they don’t burn. Leave the arlettes to cool on the cookie sheets just until they are cool enough to handle, then transfer them to a cooling rack. Serve warm with coffee, tea, or ice cream (or by themselves, because they are delicious on their own).